This website is my gift to you. 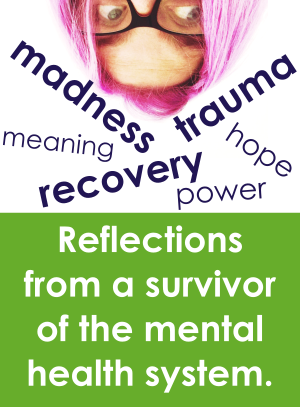 It's a space to explore madness, trauma, emotional wellbeing, recovery and healing from the perspective of someone who's lived it. Years ago, psychiatrists said I had such serious 'mental illness', that I'd be unemployed and heavily medicated for the rest of my life. But they were wrong. I healed in spite of the mental health system. I lied to get away from hospital services. I went off all the psychiatric drugs. And instead I accessed peer support, the hearing voices approach, and counselling for my childhood trauma. Today I have an extraordinary life. I’m a well-paid and respected professional consumer advocate, speaker, writer and trainer. I’ve even been paid to teach mental health clinicians how to do their jobs better, and to advise governments on mental health policy.